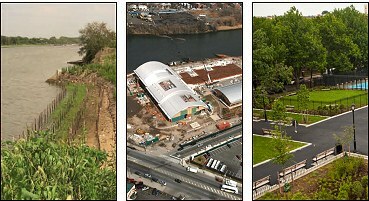 On March 8, 2012, the New York State Department of Environmental Conservation (DEC) and DEP signed a groundbreaking agreement to reduce combined sewer overflows (CSOs) using a hybrid green and gray infrastructure approach. As part of this agreement, DEP will develop 10 waterbody-specific LTCPs plus 1 citywide LTCP to reduce CSOs and improve water quality in NYC’s waterbodies and waterways. The goal of each LTCP is to identify appropriate CSO controls necessary to achieve waterbody-specific water quality standards, consistent with the Federal CSO Policy and the water quality goals of the Clean Water Act (CWA). The LTCP Public Participation Plan describes the methods DEP will utilize to raise awareness about, foster understanding of and encourage input on the development of waterbody-specific and citywide LTCPs. The 2012 CSO Consent Order outlines, among other things, a roadmap for the implementation of green infrastructure throughout the combined sewer areas of the City. The goal is to manage stormwater runoff and reduce combined sewer overflows, thereby improving water quality and promoting sustainability. To review Green Infrastructure related Consent Order Submittals visit Green Infrastructure Plan and Reports. Please visit the LTCP Citywide Meetings Homepage for meeting summaries, presentations, agendas, informational handouts and more! If you wish to submit comments or suggestions on the Long Term Control Plan, please email them to ltcp@dep.nyc.gov. If you wish to sign up to receive LTCP Program announcements, please click here and include your name and contact information in the body of the email.